Are You Really Earning a Living, Or Just Funding Your Hobby? See http://www.apgen.org/conferences/index.html for a full description of the program. You can order with your credit card at http://www.apgen.org/catalog/products.html -- while supplies last. I received the following press release from Elissa Powell, the Co-Director of GRIP. I am excited about this new genealogy institute and the courses they are offering. It is a great addition to the genealogy education community. The courses are expected to fill quickly and waiting lists will be created when they do. In addition to the daytime courses, students may attend evening lectures which will also be open to the public. 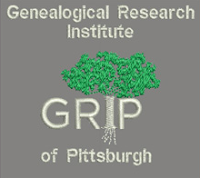 Two of the four evening lectures will be sponsored by the Great Lakes Chapter of the Association of Professional Genealogists, and by the North Hills Genealogists of Pittsburgh. GRIP courses provide a week-long intensive educational opportunity for hands-on learning in a community atmosphere. For more information please see www.GRIPitt.org where you may subscribe to email notifications.